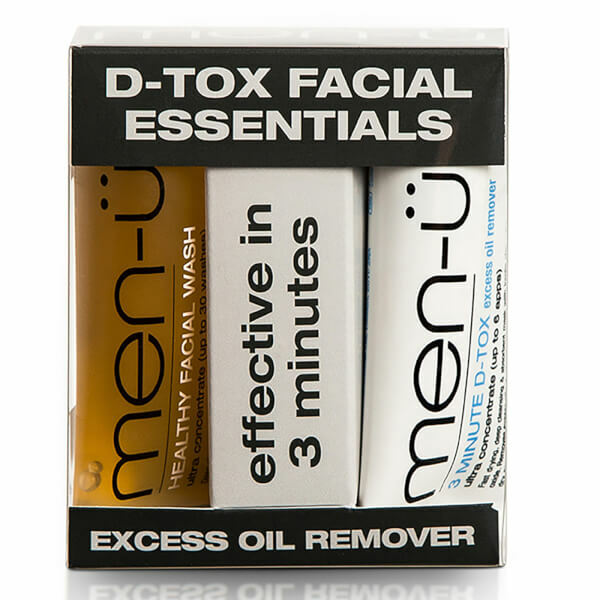 The men-ü D-Tox Facial Essentials Kit combines a duo of must-have skincare products for men. Men have more active sebaceous glands which results in more sebum and more oil. Combat this with a deep cleaning facial wash and absorbent face mask. Expect soft, revitalised and decongested skin. Soap free and pH balanced, this deep cleansing facial wash is ideal for pre and post shave when your skin is most vulnerable. Fortified with antiseptic Tea Tree Oil, Witch Hazel and Aloe Vera, the refreshing blend helps to protect from spots and shaving irritation, whilst soothing and controlling excess grease. Working into a discreet lather, the cleanser will leave your face highly moisturised and free from irritation. A fast drying, deep cleaning face mask that works to remove impurities and control excess oil, impurities and dead skin. Its unique formula contains powerful ingredients, including Kaolin Clay, Witch Hazel and Zinc Oxide to exfoliate and decongest clogged pores, revealing healthy-looking skin. Suitable for normal, combination and oily skin, the absorbent mask performs a deep clean to leave skin smoother and firmer looking. 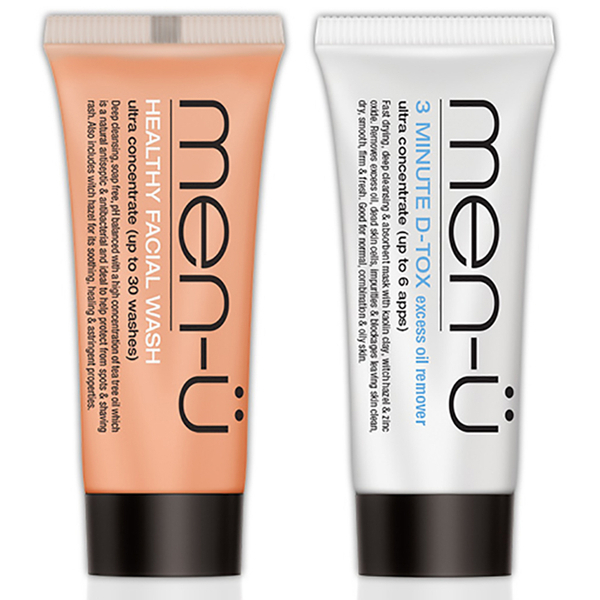 Start your cleanse with the men-ü HEALTHY FACIAL WASH, you only need a small amount. After washing and rinsing, dry the skin with a clean towel. 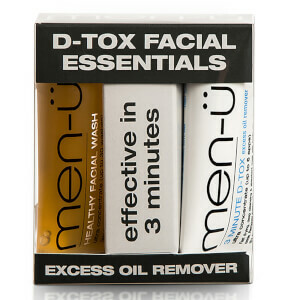 Apply men-ü 3 MINUTE D-TOX to the required area - either full face or the T-Zone (forehead & nose). Leave for 3-5 minutes as required. Rinse off and wash again or take a shower. Pat dry. Healthy Facial Wash: Aqua, Glycerin, Sodium Laureth Sulfate, Cocamidopropyl Betaine, PEG-7 Glyceryl Cocoate, PEG-12 Dimethicone, Melaleuca Alternifolia (Tea Tree) Leaf Oil, Acrylates/C10-30 Alkyl Acrylate Crosspolymer, Mentha Piperita Leaf Extract, Xanthan Gum, Panthenol, Propylene Glycol, Hamamelis Virginiana Bark/Leaf/Twig Extract, Sodium PCA, Sodium Lactate, Benzophenone-4, Aloe Barbadensis Leaf Juice, Disodium EDTA, Sodium Hydroxide, Lactic Acid, Triethylene Glycol, Benzyl Alcohol, Limonene, Fructose, Inositol, Glycine, Urea, Niacinamide, Sodium Benzoate, Magnesium Nitrate, Methylparaben, Magnesium Chloride, Sorbic Acid, Methylchloroisothiazolinone, Methylisothiazolinone, CI 15985, CI 16035, CI 42090. D-Tox ‘Deep Clean’ Clay Mask: Aqua (Water), Kaolin, Paraffinum Liquidum, Glycerin, Lanolin Alcohol, Oleyl Alcohol, Zinc Oxide, Magnesium Aluminium Silicate, Cera Alba (Beeswax), Cetearyl Alcohol, Polysorbate 20, Sodium Acrylates Copolymer, PPG-1 Trideceth-6, Sorbitan Palmitate, Xanthan Gum, Parfum (Fragrance), Hamamelis Virginia (Witch Hazel) Extract, Benzyl Alcohol, Triethylene Glycol, Propylene Glycol, Sorbic Acid, Phenoxyethanol, Linalool, CI77891 (Titanium Dioxide), CI77288.